Easyboots made the cover of a new book called Leg and Hoof Care for Horses. I have a copy on order and will post an update. 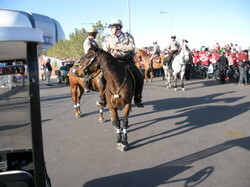 We had a surprise visit today from four of the mounted officers from the Scottsdale Police Department Mounted Unit. 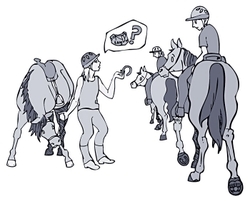 EasyCare has been helping fit their horses over the last 10 years with Easyboots and Easyboot Epics. 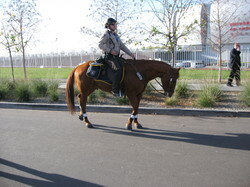 All department horses are fitted with hoof boots during patrol to increase traction and reduce concussion injuries. 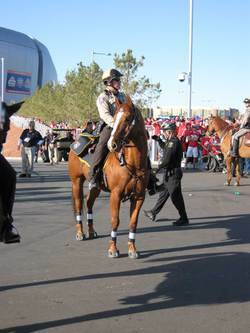 "In appreciation of your generosity and community commitment to the Scottsdale Police Department Mounted Unit. 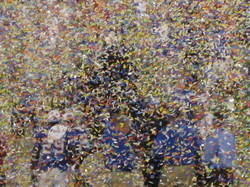 Your support will ensure the continued success and community service of the citizens of Scottsdale." 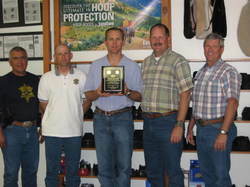 "Thanks for keeping us on our feet"
I'm pictured (center) below with four of the officers that drove down to Tucson to present the plaque. I've also included some photos of the officers at work fitted in boots. What color Easyboot would you like to see? We've discovered a new feature in Google Docs that can help us run surveys. This can come in quite handy when we're curious what you think about our products. Karen has asked what you think about adding a little color to our Easyboots. We've made them in red in the past, and we still see them on the trail! Why not liven up the current black hoofboot with a splash of color? So be sure to visit Karen's blog to and tell us what color you'd like to see if any. The survey is very quick and easy. All you have to do is answer "yes" or "no" and add the color you had in mind. It's that easy! So why not let us know what color you had in mind? 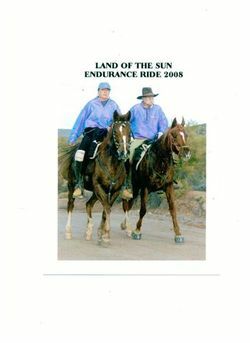 Crockett Dumas and his horse competed at the Land of the Sun 50 mile endurance event with Easyboots. 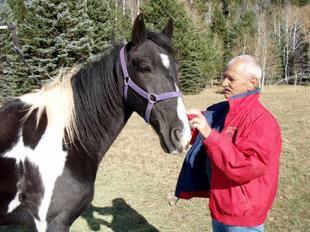 Crockett is a long time endurance rider and past president of AERC. Crockett has completed over 30,000 miles of AERC sanctioned events. 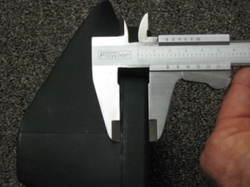 The #5, #6 and #7 Easyboot and Easyboot Epic have received an increase in sole thickness for 2008. With more and more large breeds using hoof boots on pavement and street environments we decided to beef up these boots to increase wear. The #6 Easyboot and Epic have received an additional 4mm and now have a total sole thickness of 18mm. Traveler wears Old Mac's, Easyboots, and Easyboot Epics! 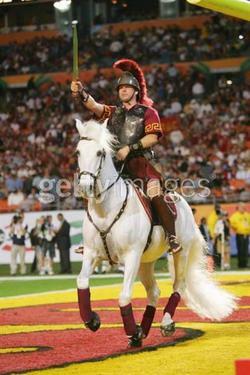 Check out these cool pictures of USC's Mascot Traveler sporting Old Mac's, Easyboots, and Easyboot Epics. 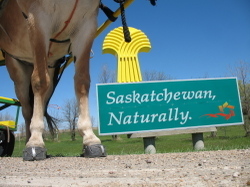 Clearly, this horse knows style and that using EasyCare hoof boots keep him safe while he performs/works! 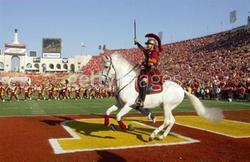 Some photos by Getty Images. Imagine riding from Reno to Washington, D.C. in an endurance competition--and back! 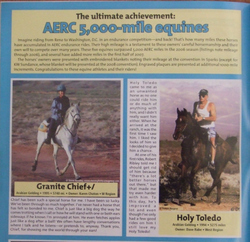 That's how many miles these horses have accumulated in AERC endurance rides. Their high mileage is a testament to these owners' careful horsemanship and their own will to compete over many years. These two equines surpassed 5,000 AERC miles in the 2006 season. 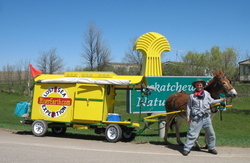 Dave Rabe has three horses with over 5,000 miles. Karen Chaton has three horses with over 6,000 miles The majority of both Dave's and Karen's miles have been in Easyboots and Easyboot Epics. Got some additional great news this week. 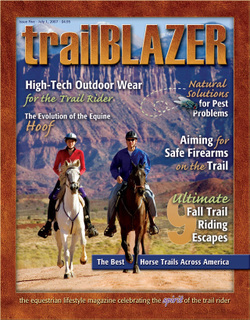 Easyboots and Boa Horse Boots are shown on the cover of TrailBlazer Magazine. Not a bad month. EasyCare was featured on the cover of Equestrian Retailer, Tack'n Togs and TrailBlazer! Bernie Harberts and his mule are at it again. 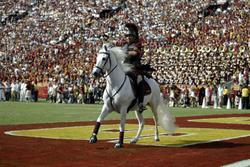 On March 15th 2004, Bernie and Woody set off from North Carolina on the way to San Diego, California. The trip across the USA ended 13 months and 3,500 miles later. Bernie and Woody are now traveling from northern Canada to the southern USA on the Lost Sea Expedition. The team just crossed over the Canadian border into Montana. 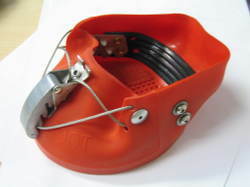 Woody uses Easyboots along the way to protect his feet. Check out our interactive boot builder! You can now build and order your own custom Easyboot! 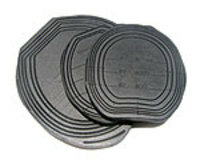 Here you can choose your own fastening system, tread pattern, back strap system and size. Check it out! 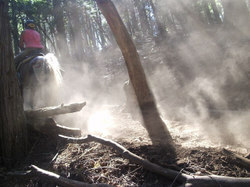 The January cover of Endurance News has a great photo of two horse and rider teams cranking down the trail in Easyboots. Amanda Anderson and Mahleek Nahbeel ride with Cynthia Peticolas-Stroud and Arifi on Day 2 of last September's Old Selam Ride in the Northwest Region. 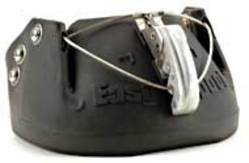 Easyboots have completed more endurance miles than any other hoof boot. 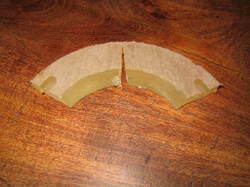 Before you purchase a hoof boot ask the manufacturer how they have done in endurance. Are you interested in the sport of endurance? Check out the AERC website to learn more. 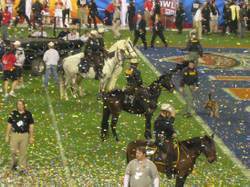 The BCS National Championship game ended up to be very one sided and not the best football game. The highlight of the game for me was all the Easyboots. 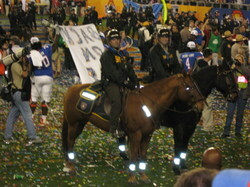 The mounted police horses working the pre game and post game crowd were fitted with Easyboots. It was great showing the FedEx group our product and talking about how to implement our new shipping procedures. Nothing like going to a world televised event and seeing your product all over the field. Do you want to see Easyboots in Colors? Help EasyCare decide by casting your vote here. 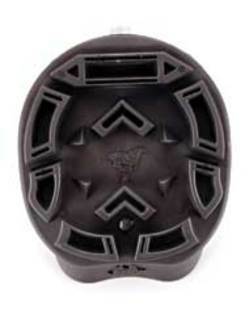 Easyboots are an essential piece of equipment for every trail rider and horse owner. Regardless of your belief on the "Barefoot Movement" or using iron shoes, Easyboots have a definite place for every horse owner. I went for a ride before work today and came across part of the plastic shoe below. I found the piece of the shoe in a very rocky area and can only hope the rider was equipped with an Easyboot, Old Mac's, or Boa. 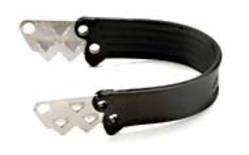 We used an advertising slogan in the past that said, "Carry an Easyboot or Get a Sense of Humor." 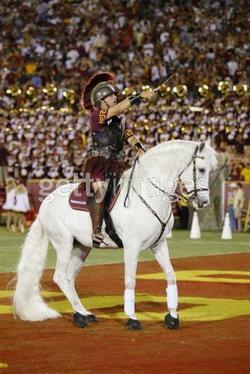 For the horse's sake I hope the rider didn't need a sense of humor.